If you’re looking for a chainsaw where both portability and reliability are key, then a gas chainsaw could be exactly what you need. With a gas powered chainsaw, you can work virtually anywhere that you need to, as long as you have fuel supply, and with regular maintenance, a gas chainsaw could easily last a lifetime. We’ve covered a number of gas powered models in our detailed chainsaw reviews, and here are three more high quality units that are worth your consideration. What could be considered the ‘baby’ of the Husqvarna range, the 240 gas chainsaw is an excellent introduction to the world of high powered Husqvarna outdoor tools. Weighing in at just 10.3 pounds, this chainsaw is both portable and easily manageable. In addition to the small 38cc engine size, the 16” blade makes it perfect for pruning and clearing work on a medium or large size property. Although this chainsaw is relatively small and easy to use, it still packs decent power for its price range. With 2HP of total output, it can compete with many of the high quality electric chainsaws that are available, with the additional benefit of it being gas powered, which means you won’t have to worry about recharging a battery pack or being tethered to a mains power outlet. Standard safety features that you would expect are all here, including a low kickback chain design, and chain brake for added safety. Using the saw is also easy, with a standard hand grip and a handle that has been designed to reduce vibrations. There’s also a strong handguard, and many current owners have praised the quality safety features and easy maneuverability. As you will find when operating a gas chainsaw, the way it handles can contribute a lot to overall safety, and because you won’t struggle to operate the 240 you will find that cutting is easier and you’ll feel more confidence when working behind the chainsaw. The 16” bar size is perfect for home and ranch use, providing you don’t need to cut down any trees of significant diameter. You’ll be able to safely work with trunks of up to 32” when using the right cutting techniques. Some larger trees could be cut, but you’ll need some experience to do so safely, and you may want to seek some assistance or training if this is your first time using a gas chainsaw. Click the link below to check the latest price and offers on Amazon. If you like the look of the Husqvarna 240, but you need some more power to take care of a range of jobs on a large property, then the 445 model is a logical step up. It features a slightly larger engine, and produces a total of 2.2HP. Although the power rating might not seem significant, it can make the difference on some jobs, especially where a less powerful chainsaw might get bogged down in harder wood. This chainsaw produces low emissions and uses Husqvarna’s X-Torq engine design that can lower overall fuel consumption. However, this model is not CARB compliant, so it’s not suitable for use in California, and is not offered for sale to residents in the state. One excellent feature in the 445 is the centrifugal cleaning device. This is a special air mover that is incorporated before the filter, and it helps to remove dust and debris that could otherwise clog the filter. This means that you’ll have longer before needing to clean or replace the air filter, which reduces the overall maintenance that is required for this unit. The 16” bar is a popular size in entry-level / mid-range gas chainsaws, and in most cases you’ll be able to perform cuts on trees that are twice the diameter. For pruning work, a smaller bar makes the chainsaw safer and more manageable, and the low weight of just over 9 pounds makes this an excellent choice for first time chainsaw operators. It’s highly portable and runs on a standard fuel / oil mix, so you’ll have no problem keeping up with a long day of work, as long as you’re carrying the right amount of fuel with you. Consumer feedback for this chainsaw has been highly positive, with the average review score being 4/5 from online reviews. Users have praised the high build quality (something that Husqvarna is well known for), and excellent cutting power that exceeds what could be expected from a unit of this size and in this price range. If you like what the 445 has to offer but are wondering what a larger model from the same company might offer, then check out or full review of the 55cc Husqvarna 455 Rancher model. Although a step up in both performance and cost, it will give you a good idea of how the attention to quality and performance is carried throughout the Husqvarna range. Check below for latest price and offers. 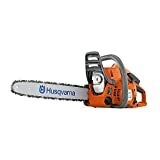 Although XtremepowerUS doesn’t carry the same kind of brand recognition as a brand like Husqvarna, this is still a great option if you’re looking for a gas powered chainsaw but you’re on a relatively tight budget. The first thing that you’ll notice about this chainsaw is the excellent entry-level price. In fact, this is one of the most affordable gas powered chainsaws that can be purchased at this time. Despite a budget friendly price, there’s still plenty to like about this chainsaw. It features a 22” bar chain so you’ll be able to cut through logs and living trees that are around 40” in diameter. This chainsaw features an automatic chain oiler, much like you would find on more expensive chainsaws. This is by no means a toy, and with some good cutting technique, you’ll be able to cut through both living wood, and other timber for firewood or other home projects. 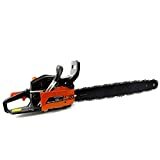 If you need a workhorse chainsaw for pruning and light tree cutting on your property, then this is a chainsaw that you should be interested in. It comes with basic tools for adjusting the carburetor, and there’s a reliable chain tension adjustment system built into the chainsaw. Rated at 2.4HP, this will provide more power than a comparably priced electric chainsaw, and the fact that it runs on gas makes it much more portable and convenient for a larger property. The XtremepowerUS 22” chainsaw also meets EPA standards, so it produces fewer emissions when compared to older chainsaws. Other standard features like a low kickback chain, chain brake, and reduced vibration handle, all make this a compelling option at the lower end of the market. User feedback has been extremely positive for this chainsaw, with owners praising the easy use, excellent performance for the price, and easy serviceability. Click below to visit the Amazon product listing. These three models are excellent starters is the world of gas chainsaws, and will perform well for light duty work on mid-sized and larger properties. If you’re looking for something with a bit more power or even if you just want to compare these models to other options that are out there, then don’t forget to look at our comprehensive chainsaw buying advice section.